Great Expectations (Sterling Classics) (Hardcover) | Broadside Bookshop, Inc. 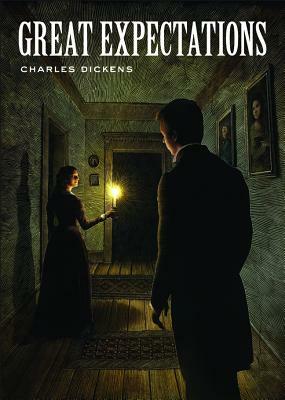 The bestselling Sterling Classics series continues with Charles Dickens's Great Expectations--one of the most popular novels of all time. When Philip Pirrip, nicknamed Pip, is approached by an escaped convict and forced to steal food and supplies, he little realizes how this act will alter his life. This handsome, unabridged edition, with striking illustrations by Scott McKowen and questions for discussion by the esteemed educator Arthur Pober, will find a treasured place in any family's library. Charles Dickens was born on February 7, 1812, in Landport, Portsmouth, in Hampshire. The second of eight children, Dickens was pulled out of school at the age of 12 and forced to work at a local factory. In his early 20s he began to publish stories about London life in various periodicals, but it wasn't until the publication of The Pickwick Papers in 1836 that he became well known. Dickens is now considered the most successful British author of the Victorian age, having written such masterpieces as Great Expectations, A Tale of Two Cities, A Christmas Carol, and Oliver Twist. Dr. Arthur Pober has spent more than 20 years in the fields of early childhood and gifted education. He is the former principal of one of the world's oldest laboratory schools for gifted youngsters, Hunter College Elementary School, and former Director of Magnet Schools for the Gifted and Talented in New York City. Arthur is currently the US representative to the European Institute for the Media and European Advertising Standards Alliance. He lives in New York City. Scott McKowen has created award-winning posters and graphics for theater companies across Canada and the US--including on Broadway. His work has been exhibited in art galleries on both sides of the border, and in 2002 he curated an exhibition of theater posters from around the world that appeared in Stratford, Ontario, and Ottawa, and at the Design Exchange in Toronto. Scott was also commissioned by the Royal Canadian Mint to design Canada's 2001 silver dollar. He lives in Stratford, Ontario, Canada.